Those who hope shall renew their strength and mount up with wings as Eagles. Isaiah 40:31 and that is exactly what Rhio O’Connor did. 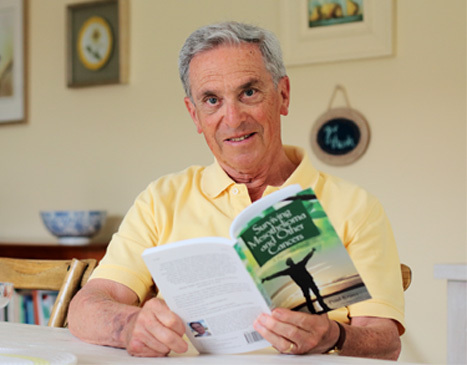 Having been diagnosed with pleural mesothelioma caused by exposure to asbestos, he set out to not give up instead to seek alternative means to better manage this deadly disease. With a prognosis of less than a year to live, Rhio surpassed his prognosis by more than six years. He researched hundreds of articles that supported nutrition therapy to manage his cancer Gaining knowledge, insight and possibilities, Rhio improved the quality of his life. Nutrition and spiritual trust helped to optimize his emotional and physical needs and balance his immune system. He did not let any stone unturned. He researched, interviewed professionals and patients and studied the effects of therapies. Rhio soared like an eagle never giving up just trusting, loving, researching and accepting as he traveled on his journey. How would I handle a cancer diagnosis? As in most instances, unless you have actually walked a mile in someone else’s shoes; it is hard to know. Yet having watched my mother at age 39 face the challenge of cancer with a three-year-old and eight-year-old, I could only hope that I would face it with the same strength and courage that she did. My mom like Rhio chose to face her cancer head on. They both seemed to soar like Eagles and glided through these deadly diseases with great hope. Mirroring Rhio in many ways, my mom had been exposed to liquid chemicals from an X ray machine at work that leaked for four years into her office. Although there was obvious neglect allowing this problem to occur for so long on the part of the doctors who owned the building, my parents never held anyone responsible for what most of her doctors felt was the cause of so many of her illnesses. Within the past ten years she had been diagnosed with breast cancer, uterine cancer, seizure disorder, meningitis and liver disease. She has had numerous surgeries and out of town hospital stays. She has been out of work for ten years, which has put a financial strain on our family. Through it all she maintained an extremely positive outlook which I know is what carried her through. Being a registered dietitian, my mom also believed in the importance of good nutrition. Given the variety of illnesses she faced, my mom researched and determined what she felt was appropriate supplementation. As with Rhio, she felt her choices to supplement and eat well helped improve the quality of her life. As my mother has often said, she sees her adversities as blessings. I may have never thought of it that way but somehow seeing how we made it through even the most difficult times changed my perspective. She was diagnosed with her breast cancer on Good Friday at the stroke of three o’clock. When I first found out my mom had cancer, all I could think of was that she was going to die. She was so sick and then when she lost her hair, I was so scared. As sick as my mom was, my parents knew that I had to go to counseling because I was so overwhelmed. I guess at my age all I knew about cancer was it meant only one thing, you would die. With this counseling and only by the grace of God the Holy Spirit came upon me helped me rise above it all. My gift to my mom is my faith. To this day I often wonder how strong my faith would be had it not been for the many adversities our family endured. I find myself participating in Christian events on campus and find such peace at school. I would often hear my mom say Why me Lord, why did you choose to stand by my side? At first I thought she was asking just Why Me until I grew older and hear it as she truly meant it, grateful for her faith and all of the support So when asked what I would do if faced with cancer I would hope as both Rhio and my mother did that I would face cancer with great strength, perseverance, faith and hope. I would search out as much information pertaining to the type of cancer I had and be sure they were all reliable sources. Today especially there are so many opportunities on the Internet yet the accuracy of information needs to be challenged. I would also rely on as many health care professionals and patients with the same diagnosis as possible to help sort through all of the information and possibilities. I believe listening to patients and their families and what pulled them through is highly effective. I certainly would contact research and teaching hospitals as well as various reliable cancer associations to gather as much information as possible to help make informed decisions. I would respect the expertise of the doctors from around the country. I believe the extraordinary effort Rhio took to manage his illness is what made the difference in his life, as well as all that knew him and all of us inspired by him. As the army of family and friends supported my mom and dad, I know I too would draw such great strength from those around me. Often those around us would say they wondered how my mom got through it all for so long and she would answer saying” it wasn’t me, humanly you could not do it alone, that it was God who carried me through.” So my faith, as the faith and optimistic spirit of Rhio and my mom, would be my greatest help. I certainly would consider alternatives measures and or consider being part of a study group as my mom did. Nutritional support I believe can be a cornerstone of our life especially during an illness. I would hope to never give up and always stay positive. I often can hear the song Live like you were dying by Tim McGraw and it is so meaningful. None of us have a guarantee of tomorrow whether young or old healthy or sick and we should live each day as it were are last. I truly believe that we can enrich our life’s journey like Rhio and my mother did. It is people like them that teach us life’s greatest lessons that of faith, hope, and love. Cancer somehow helps you to look at life differently and although I did not experience it my self-looking back I can see the journey is not an easy one. In which direction you choose to take is up to you. We can choose to let cancer take our life over or let our life be enriched by it. Rhio’s life lives on through the inspiration that all of us applying for this scholarship have witnessed. There is no doubt that people like Rhio and my mother have conquered the greatest human achievement and that is trusting in God. Both Rhio and my mother have been to so many people, both soaring On Eagles Wings.